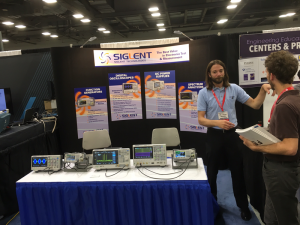 SIGLENT Technologies attended and exhibited at this year’s ASEE 2017 show in Columbus, OH, held June 25 – June 28, 2017. ASEE is the largest Engineering Education conference in North America and the exhibit hall was loaded with display booths from electronics and software vendors from around the world. SIGLENT showcased our most popular educational products including the SSA3000X spectrum analyzers, SDS2000X/SDS1000X-E digital oscilloscopes, and SDG2000X/SDG1000X arbitrary waveform generators. The SSA3000X family of spectrum analyzers are the result of over 3 years of research and development and are perfect for basic RF education and digital communications basics. It features a large 10.1 inch WVGA (1024 * 600) display, -161 dBm/Hz displayed average noise level (DANL) and -98 dBc/Hz offset phase noise (1 GHz typical, 10 KHz offset). Frequency range is 9 KHz – 2.1 GHz (or 3.2 GHz). Multiple options include tracking generator, advanced measurement kit, reflections measurement kit, and EMI measurement kit. Another one of SIGLENT’s more popular models is the SDS1202X-E oscilloscope. The “X-E’s” have kept the powerful features found in the SDS1000X Series models, maintaining the series’ simple and elegant appearance and interface design, use of SPO2.0 technology, and equipped with a full-featured hardware digital trigger system. The SDS1000X-E also includes the same 1 GSa/s sample rate, a waveform capture rate up to 400,000 wfm/s, record length up to 14 Mpts, and supports a 256-level intensity grading and color temperature display. This level of performance is a true breakthrough at this price point. The ASEE conference is a very popular exhibition for us. We firmly believe that SIGLENT is the best value in electronic and measurement instrumentation. We provide the right tools and support for any customer level: From beginner to seasoned veteran. We wish to thank everyone who came by our booth and we look forward to seeing you again next year!